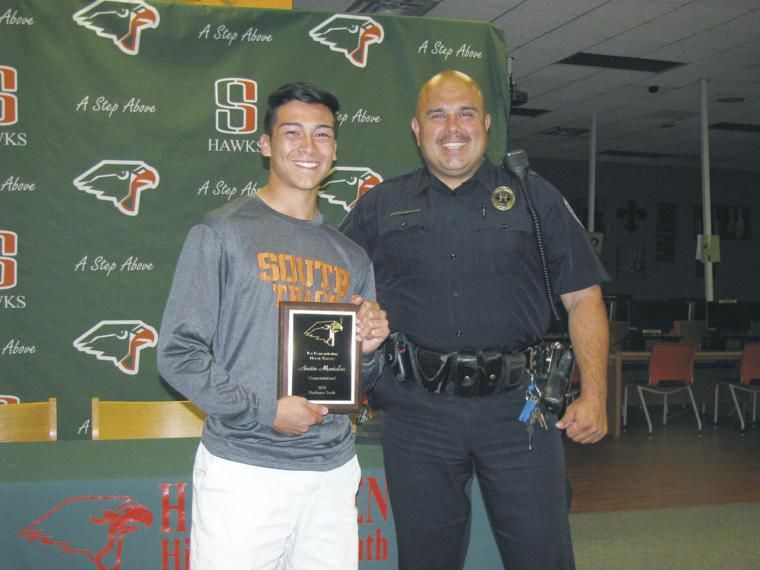 Harlingen Police Officer Orlando Gonzales presents a plaque to Austin Montalvo for his heroism. HARLINGEN — The screech of tires broke the spell of his sister’s dance recital. Austin Montalvo, 17, rushed out of the HCISD Performing Arts Center and saw a truck completely flipped over. “I was thinking, ‘Oh, no, something happened,’” said Austin, who then described how he helped first the elderly woman and then the driver out of the car. Austin didn’t know what he was dealing with when he ran to the car just a few days ago. It could have caught fire or even exploded at any moment, but all he cared about was helping the occupants. Austin, who runs track and plays football at Harlingen High School South, was recognized yesterday for his bravery by the Harlingen Police Department. “I am very proud of his heroic act,” said Officer Orlando Gonzales as he presented a plaque to Austin. Nor did Austin, a junior, freeze or hesitate as he ran to the car, and that’s what Gonzales and others at the small ceremony couldn’t stop talking about. Harlingen South Principal Fernando Reyes was slightly incredulous about Austin running toward the wrecked vehicle and possible danger. Austin took it all in stride. He didn’t seem to think it was heroic. He’d just helped two people out of a car that might have erupted in flames at any moment. Such was still the case yesterday when so many people — including his teammates — gathered in the library and applauded him. “I wasn’t expecting all this,” he said with a casual smile. His parents, Veronica and Alejandro, beamed with pride. “He ran so fast,” said Veronica Montalvo, remembering her son dashing out of the PAC to the accident scene. “I am just proud of him that he rescued them,” she said. Fortunately, the two elderly people are doing fine, thanks to the quick thinking of a young high school kid.